Dimming and CO absorption toward the AA Tau protoplanetary disk: An infalling flow caused by disk instability? High-resolution spectroscopy of [Ne II] emission from AA Tau and GM Aur. Carbon isotope fractionation in protoplanetary disks. 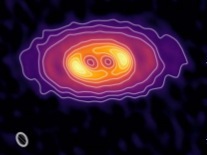 Organic molecules and water in the planet formation region of young circumstellar disks.